Some colorful new décor hit the windows of Silicon Valley restaurants Friday and it’s wall art now required by the county that comes after an NBC Bay Area investigation. Santa Clara County health inspectors started handing out green, yellow and red score cards (denoting a Pass, Conditional-Pass or Fail score) that restaurants are required to hang in their front windows. The county has also upgraded its website to a user friendly interface that can quickly tell consumers the restaurant’s number score, and the details of the inspection after just typing in a restaurant name. 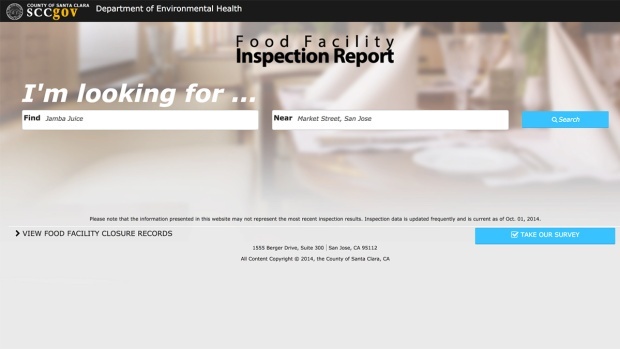 The County's new food inspection website is far easier to use than it used to be. Back in February, 2013, The Investigative Unit went undercover to expose Silicon Valley restaurants not following a state law requiring them to show customers their most recent inspection report if asked. The Unit also found the county’s Department of Environmental Health website had inaccurate and confusing information, only listing categories of violations but not specifying what restaurants did wrong or if they had been shut-down. Considering all this, and no scoring system, it was nearly impossible for customers to know how clean restaurants’ kitchens were. After the first story aired, the Board of Supervisors formed an advisory group of restaurant owners, food safety experts and members of the community to review different potential scoring systems. In April, this colored system was presented to the board and passed. The first scorecards went up this week. Simitian has been pushing for more restaurant accountability since his first term on the Board back in 2000, but at the time he received little support. Since then, other counties like Los Angeles, San Diego and Sacramento have implemented scoring systems, but he says for Santa Clara, it’s better late than never. “That we here in Santa Clara County have been a little slow to the party, is unfortunate, but I feel good about where we are today,” Simitian said. He also thinks the new and improved web site, that shows numerical scores and inspection report details, is an essential change. “The old system was about as user unfriendly as it could possibly be, it didn’t actually post the list of violations or a simple score, now you can go online and tell right away if they are doing a top job of keeping their place clean, and you can tell if they’re not,” Simitian said. Check out scores for restaurants in your neighborhood on Santa Clara County’s new restaurant tracker site.